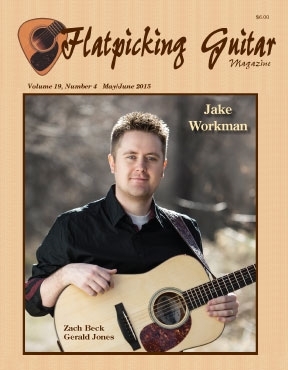 Welcome to the May/June 2015 issue of Flatpicking Guitar Magazine! In this issue we feature Jake Workman, lead guitar player for the bluegrass band Driven, on the cover and we also highlight a talented young flat picker from Utah named Zach Beck. Additionally, we feature a long-time friend of the Flatpicking Guitar Magazine, and Texas bluegrass veteran, Gerald Jones. Also, we include an article about Celtic Guitar playing by John Carnie. As always, our regular columnists are also on board to provide you will some wonderful tunes to help bring you into this year's festival season. Tune up your guitar, its time to pick!